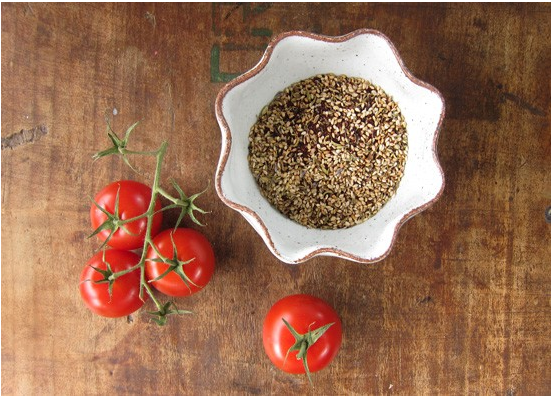 Stop Boring Meals with Za'atar! A couple weeks ago I was telling a friend that I was getting bored of my meals. She mentioned that she was eating a lot of salads and that they weren't getting boring in the least. Her trick: za'atar. So I looked into it (plus she passed along some general instructions and ingredients). And oooooh boy, was she right. 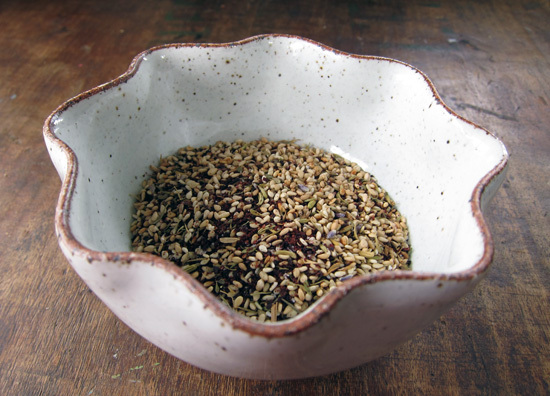 Traditionally, this spice-seed blend, tops a Middle Eastern fattoush salad. Tomatoes, cucumbers, fresh herbs, a garlic dressing and then the za'atar. ZA'TAR, because this stuff needs all caps. 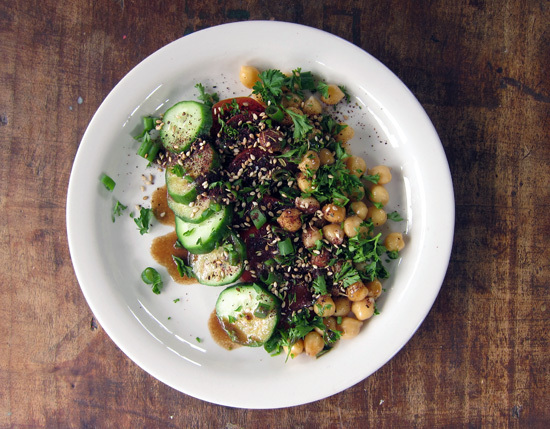 And it's great on fattoush, but it's also great on just about anything. Salads, roasted chicken… probably even pizza! Here, I've topped it onto the simplest salad: sliced tomatoes, cucumbers, chickpeas, green onions, parsley and a basic vinaigrette. 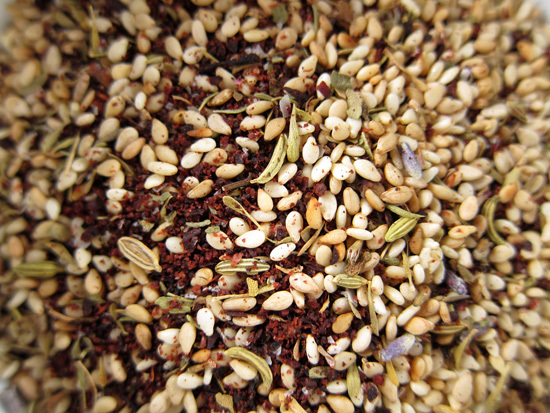 Sprinkle on the za'atar. It's easy to make too! I toast up some raw sesame seeds in a small skillet and when they start to "pop" and get lightly golden, they're ready to be removed from the heat. Sumac is the next big ingredient which you can find at any Middle Eastern market or good spice merchant. Sumac is a tart bright berry that gives food a good lemony bite. Oregano and thyme are more traditional accompaniments, but I like using herbs du provence because it's so pretty. I make enough to last me a couple weeks, but usually I use it up much sooner than that. It's a daily use kind of thing. So get sprinkling and stop making boring meals! Mix all ingredients in a small bowl and then carefully spoon into a lidded jar for storage. Keep in a cool dark place and use often! Good post. Burberry handbags outlet, cheap burberry bags on sale, 60% off. Welcome to designer burberry outlet store. Your salad looks so good! I've seen Za'atar before on menus but now that you shared the recipe for it, I'll definitely make this at home. Who knew it was so easy! Herbes du Provence is one of my faves, too. I put it in Lentil soup and it completely changes it from this boring earthy soup to this fabulous dish. I love za'atar on my breakfast potatoes... and pretty much on everything else. This looks fabulous. I've always bought my zatar (with thyme & sumac in mine) but I love your idea to make your own and the recipe sounds like a lovely version. Thanks for sharing it! Middle Eastern food has two thumbs up from me. Surprisingly I've never tried fatoush nor Za'atar but I'm keen on giving this a try. If only I can source sumac.